LUCKNOW: A day after Yogesh Raj, the main accused of Bulandshahr violence which claimed two lives, released a video to plead innocence, a fresh video has surfaced on the social media platforms released by another absconding accused in the case -- Shikhar Agarwal, an activist of BJP youth wing claiming his innocence and levelling several charges against the martyred inspector Subodh Kumar Singh on Thursday. Agarwal has been shown in the video claiming that it was the slain inspector who stopped the villagers from transporting the carcasses of cows to Chingrawati checkpost under Syana police station. "He wanted us to bury the remains then and there." “When we reasoned that it is a crime which should be made public, the inspector threatened to shoot me. It was the inspector who provoked the mob which went violent," Agarwal is seen claiming. He adds that the inspector was against registering FIR in the case of cow slaughter. Agarwal even accused inspector of indulging in corrupt practices in the district and siding with the other community. Agarwal is one among 27 accused named in the case registered for rioting, violence, vandalism and murder of two persons. However, earlier in the day, there were reports about the arrest of the main accused Yogesh Raj but the police department remained tight-lipped and did not confirm it till evening. However, later in the day, the Bualndshahr police authorities issued a denial over the arrest of Yogesh Raj. Yogesh has been absconding since Monday. However, as per the sources, the district police is getting ready to follow the court route and is likely to proceed with sticking property attachment notices on the houses of absconding accused persons. Meanwhile, two of the four persons arrested by the Bulandshahr police in the cow slaughter case registered by Yogesh Raj have denied having a role in the slaughter case. While being taken away by the police, two – Surfudding and Sajid -- claimed that they were at Tabligi Ijtme (Islamic congregation) at 40 km away from the spot of trouble from November 30 to December 4. They claimed that their presence at the congregation could be confirmed from the Tabligi Jamat. “We received a call from police that there was a case registered against us so we went to police station to inquire. We do not have a single case against us ever. I am educated with an MA degree,” said Sarfuddin. Sajid on the other hand claimed that he was a resident of Haryana and used to live in Faridabad. Yogesh Raj had got an FIR lodged against seven persons, including two minors for cow slaughtering. Later the police released the two minors. 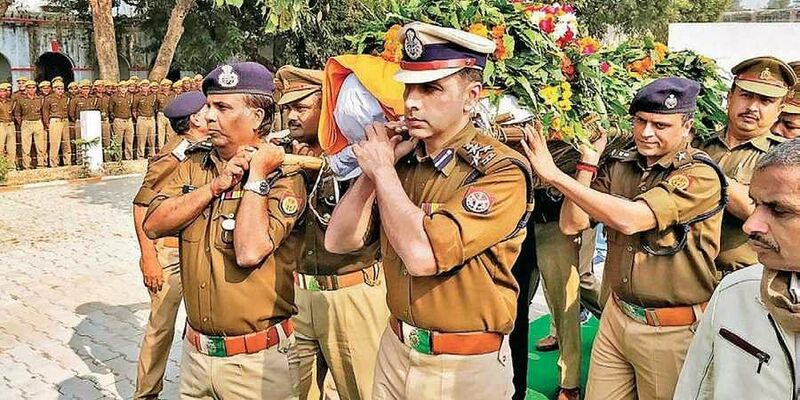 Meanwhile, early Thursday morning, CM Yogi Adityanath met the bereaved family of the slain cop and assured it that justice would be done to him and that the government would pay off all their educational and other loans, said a minister. Apart from a financial assistance of Rs 50 lakh announced earlier, the CM also promised the family of Inspector Singh that the state government would pay off their home loan worth Rs 30 lakh. They were assured of special pension and job to a person from the family. Besides, the state government also assured them of bearing the education expenses of Inspector Singh’s sons. Later in the day, the state government renamed Jaithari-Kuraoli road leading to village of late police Inspector Subodh Kumar Singh in Etah as 'Shri Subodh Kumar Singh Shahid Marg'.